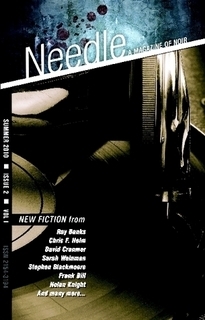 Steve Weddle is a top crime writer and also the criminal master mind behind NEEDLE – A MAGAZINE OF NOIR. I was lucky enough to sneak a story into the splendid first issue and last week the postmen cameth and broughteth issue two. And, as Frank Carson would say, it’s a cracker. The magazine continues to look great, thanks to Creative Director John Hornor Jacobs, and there’s another smashing bunch of stories – some from writers whose work I know and some who are unfamiliar to me. So, I’ll pick out a few favourites. Ray Banks’ wonderful ‘The Great Pretender’ is the first story in the magazine. It’s a fantastically well executed tale of a man who is in the gutter and is looking at,well, the gutter.Sad, hard hitting and funny, it’s a prime cut of Ray Banks, a writer who seems to be getting better and better; Stephen Blackmore’s ‘For The Children ‘ is a tense tale of sibling rivalry which lives up to it’s whip crack opening; Frank Bill’s ‘Cold, Hard, Love’ is a full flavoured taster for his upcoming hillbilly noir novel DONNYBROOK and is as brilliantly written as you would expect from Mr. Bill; David Cranmer’s ‘The Sins Of Maynard Shipley’ is a classic twisty tale with a modern edge; Julie Summerell’s short & sharp ‘Under The Rug’ has echoes of Richard Ford and Joyce Carole Oates; Nigel Bird’s ‘Beat On The Brat’ is a very clever and touching piece of multi POV storytelling. The collection ends with Chris F. Holm’s ‘The Hitter’ which is hard- boiled proof that Holm will be very, very big one day. And, of course, there’s more, as Jimmy Cricket would say, so click here and buy the bugger,eh? I should mention that NEEDLE3 is NOW available. I submitted a story there on 10/2/10. You can check status of your subission on line and mine says “received”, but hey, they probably have real lives too. Besides, I’m writin’ too much new depraved crap to even care about the old turdies.